One of the things I didn’t realize before I started researching Celiacs disease was the laundry list of foods that would be off limits for me outside of my own kitchen. Gluten hides in a lot of things so many sauces, marinades, and even non-glutenous fried foods are off the table. Essentially, I’ve been craving fries since September. Thankfully I have a deep fryer and a lot of college basketball to watch (go heels!). So I took it upon myself to make up a batch of loaded cheese fries- double fried potatoes, cheese sauce, bacon, green onions, and cilantro. It was everything I’d been missing all these months, with the added benefit of being able to eat a whole mess of fries straight from the fryer. 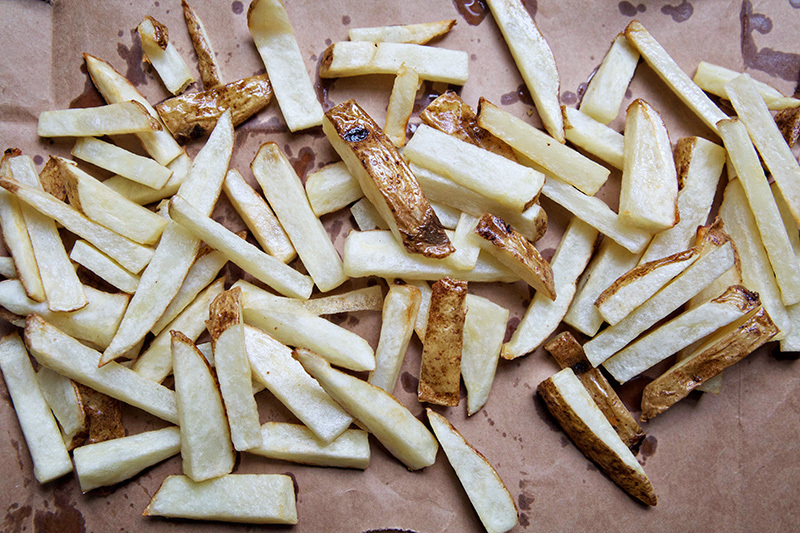 Slice your fries, skin on, into 3″x 1/4″ slices. Soak in cold water, and then squeeze into a towel to ring out. Heat your oil to 375F. 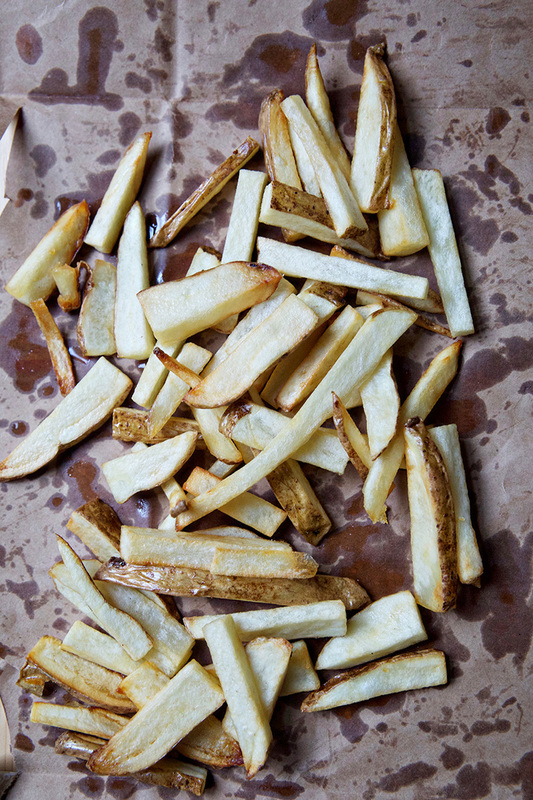 Fry for 4 minutes, and then dump onto towels or brown paper bags (you may need to do this in batches). Allow to dry for a few minutes and then fry again, for 5 minutes, until golden brown. Remove from fryer and transfer to a new sheet of brown paper or a rack. 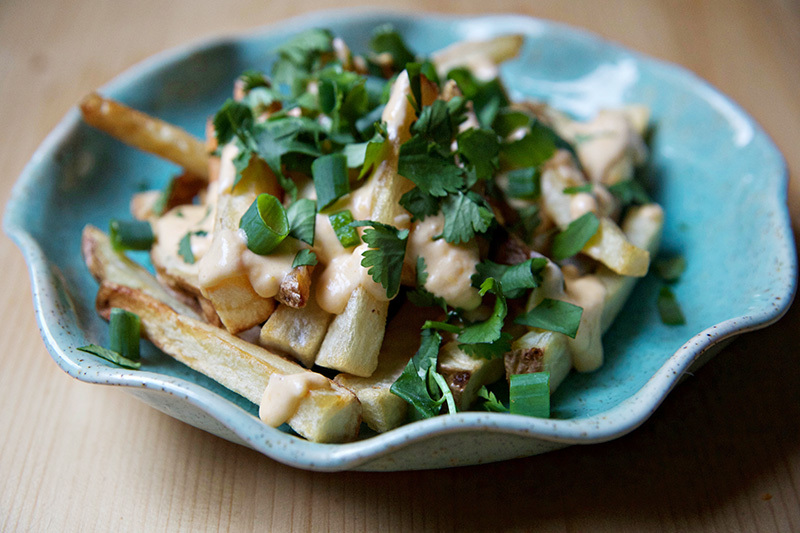 While your fries are frying, Toss your cheese and cornstarch together. Over medium heat combine cheese and 1 cup of evaporated milk. Cook, stirring frequently, until the sauce combines and the cheese melts. Add hot sauce and, if desired, a little more milk to thin it out to the consistency you’d like. 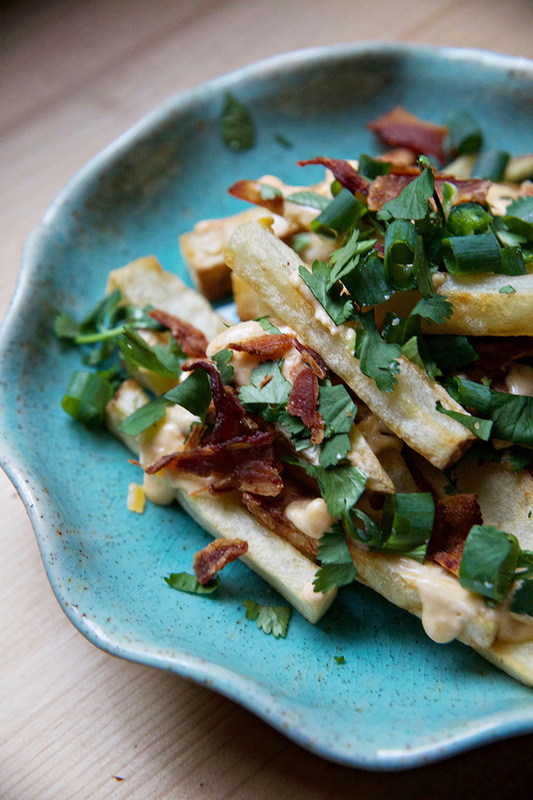 Transfer your fries to a serving plate and top with cheese sauce, bacon, cilantro, and green onions. Serve hot and enjoy! Just one word….YUM! Seriously though these look fabulous, love it!! 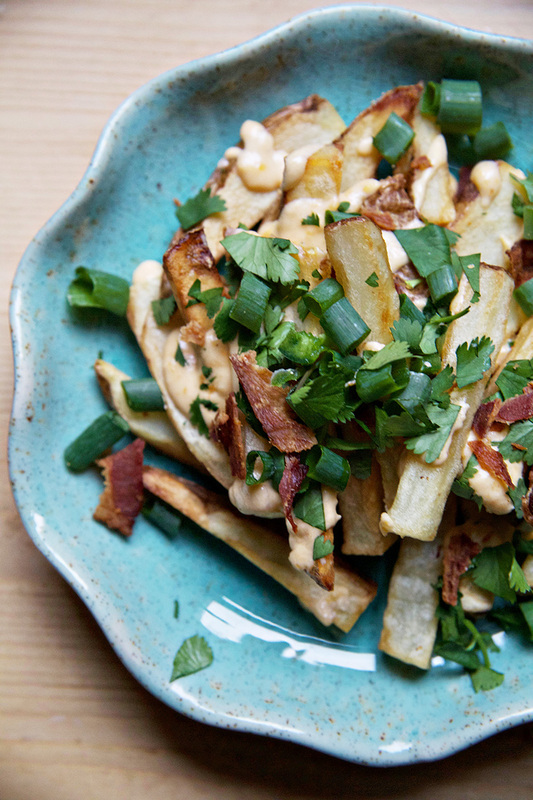 um, yes to the cheese fries. I feel comforted knowing that even if I have to give up gluten one day, I’ll still be able to enjoy these babies. so glad that you can, too! Pass the plate!! The perfect comfort food. LOVE these! Getting a hold of what is safe and what is not safe when you get a celiac diagnosis can seem overwhelming! I love these very much! I want to make it on my own on this coming weekend! Thanks for sharing! Thanks!!! Charleston is one of my favorites!